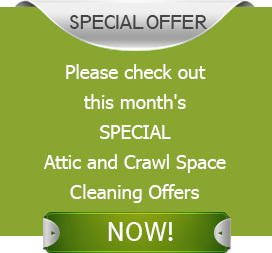 Have you ever inspected the dark interiors of your attic and crawl space in the true sense of the word? If the answer is no, the consequences of this omission could be very severe! Apparently, you are one among hundreds of homeowners who typically neglect these functional areas until it’s too late. Periodic evaluation and regular maintenance are vital for a clean, comfortable, healthy and energy-efficient home environment. An inspection by a reputable, certified and experienced company like Quartz Solutions will ensure that your attic and crawl space is in top notch condition. If left unattended the potential threats and hazards lurking in attic and crawl spaces keep progressing day by day. The truth is they can jeopardize the health and well-being of the inmates. Is it really worth the risk? Leaking and broken duct can spike your monthly power bills. They have the potential to spread harmful germs in the living space. 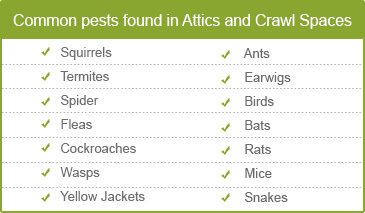 Insects like wasps, roaches and termites can cause grave injury to health. Crawling animals, like rodents, squirrels create chaos by gnawing at wires, damaging insulation wires and much more. Excessive moisture and humidity breed mold and mildew which triggers wood decay and structural damage. This can be an adverse impact on your financial resources. A meticulous inspection by a skilled workforce, well-versed in the latest techniques can pay rich dividends in terms of making the hidden corners safe and healthy. The good news is that Quartz Solutions is perfect for this undertaking. Our expert team will visit your premises to conduct a preliminary assessment totally free of charge. They will also test the areas for radon gas, a known carcinogen. Once they are aware of the current situation, experts will highlight portions for improvement and chalk out a cost-effective plan to eradicate the issues. We go by the mantra of providing high-quality service at competitive rates with no hidden costs. Be it residential or commercial client, customer satisfaction is our top our priority. Lincoln Park is quite a well-known township in Morris County, NJ. The borough was named in the honor of the great President Abraham Lincoln. In a bid to help maintain its rich heritage, Quartz Solutions will be more than happy to fix the attic and crawl space issues in Lincoln Park’s residential and commercial set-ups. If you are looking for the highest quality maintenance service for your property in Lincoln Park, give us a call today at 973-536-1013 for a free inspection and consultation.